I can’t say I’m a world traveler, but my favorite island is Kaui. Nicknamed the Garden Island, this Hawaiian island is very much unspoiled by tourists. The tiny town of Hanalei, on the less popular side of the island, is truly a postcard perfect place. The buildings are all old Hawaii, from the days of ships that put in to trade from all over the Pacific. Inland, rugged mountains covered in lush greenery and silvery waterfalls push civilization toward the beaches. Someday, if only in my dreams, I will sit on a porch in Hanalei and write another book. 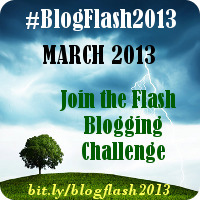 For other March Flash Blog entries, click here. That sounds like a great dream, Linda! I hope your free days went fantastically!